Knowing how to tape and mud drywall can save you a lot of time and money over time. If you own a house, eventually you will need to patch and repair some of the walls and ceilings. This article and the related information will give you all the tools you need to successfully finish drywall projects in your home. For related information see the articles, 'Troubleshooting Drywall Problems', 'How To Patch Drywall' and 'How To Install Drywall Patches'. Years ago all walls and ceilings were plastered. The plasterers thought that drywall was a flash in the pan product. Unfortunately for them it has lasted. Drywall introduced two entirely new trades into the industry. Drywall hanging and drywall taping or finishing. Plasterers have found other occupations in the construction industry, but there are far fewer of them than there are drywallers or sheetrockers. With a little practice and a few inside tips you can do an acceptable job at taping mudding drywall. This article on taping mudding drywall is informational. It is intended to provide basic how to skills to get a job done. We do not classify this information as a repair. In this series we provide you with information about materials and techniques. The information below gives you a summary of the various things involved. There are several steps, but none of them take very long. If you have a hole or large crack in your wall or ceiling, it is likely that you will need to replace some of the drywall. For instructions on removing and installing new drywall for patches, see the article 'Patching Drywall Holes With New Drywall'. The first step in taping and mudding drywall is installing the tape. Any time you have a break or crack in the surface paper, you need to bridge it with tape. There are two different kinds of tape that are commonly used for drywall repairs. The methods for installing them are slightly different. For instructions on installing paper and fiberglass mesh tape, see the article 'How To Apply Drywall Tape'. After the tape is installed and the mud is dry, you can apply the first and second coat of compound. Most patches will require two and sometimes three coats of compound. The reason for this is that the compound shrinks as it dries. So to get a smooth surface, you need to apply progressively thinner coats of compound. You also do not want to try and do too much with each application of compound. For instructions on applying the first and second coat of compound, see the article 'How To Tape Drywall Joints'. Skim coating is a very thin layer of compound that is applied as a final coat. Prior to skim coating, joints are lightly sanded. The skim coat is done by keeping the trowel tight against the surface, allowing the compound to fill any low spots. For instructions on how and when to apply a skim coat, see the article 'How To Skim Coat Drywall'. Sanding is an integral part of any taping and mudding project. A final sanding prior to painting is a must to eliminate any ridges in the compound. Light sanding between coats of compound can also reduce the amount of mud used. Drywall finishing is a touch trade and skilled professionals are able to reduce the amount of sanding by accurately applying the compound. For the rest of us, we may have to do a bit more sanding to achieve a nice finish. See the articles 'How To Sand Drywall', 'Wet Sanding Drywall' and 'Dustless Drywall Sanding' for information on the various sanding options. There are a few tools you will need to complete a drywall finishing project. However, you may not need too many. See the article on 'Drywall Taping Tools' for information on what the tools do and which ones you need. What do you mean, 'types of drywall compound'? It's the white stuff, right? Actually there are several types of drywall compound and depending on what you are doing you may want to be aware of some of them. Most drywall compound comes ready mixed, but some types are still powder mixes. I am going to run through these quickly, for most of us the type to use is All Purpose. All purpose comes in standard weight, mid weight and light weight forms. All purpose mud can be used for taping and coating. It can also be used for texture if you plan to paint the ceiling. Taping mud is used for just that. It has extra glue in it to help it adhere to the wallboard at the joints. It is not as workable for coating the seams and it is harder to sand. Topping mud does not have glue in it and is only used for coating seams and texturing. Topping mud is usually whiter and can be used for texturing without painting (that's if you want a white ceiling of course). 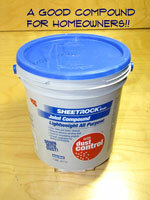 As the name implies, this is a general purpose compound that can be used for all phases of a drywall finishing project. This mud has both taping and topping properties and is a good choice if you have a small project. It will dry a light gray if you use it to texture, so you should plan on painting it. Mid weight and light weight muds are lighter versions of their standard weight cousins. Light weight muds are easier to work with (especially for amateurs) and much easier to sand. They entrain air into the mud during the manufacturing process. One of the key advantages or drawbacks, depending on how you look at it is how easy it is to sand. This is a definite plus for novices. However, it is also much easier to groove it and sand too deeply, sometimes exposing the tape. Use caustion when sanding this mud. Setting type muds have chemicals in them that allow them to dry quicker. You purchase them by the proposed drying time, anywhere from 5 minutes on up to 210 minutes. The actual drying times differ depending on a number of factors. These muds are powdered and have to be mixed when used. Do not mix some twenty minute compound and then go off and have your dinner. It will be rock hard in your pan when you come back. There are two kinds of setting muds, the original and a newer easy sand version. Make sure you get the easy sand, only the most skilled tapers can work with the original and most of them hate the stuff. It's main attraction is that it is one of the most durable compounds on the market and can fill some ugly holes. The newest innovation is a dust control mud. This is a good choice for a home repair. It comes in a light weight version and is a lot less messy than the regular muds. USG makes a light weight all purpose mud with dust control. Definitely the best of all worlds. This is the best all around mud to use for your taping mudding drywall projects. If you are in a hurry get the setting type muds (Durabond is the brand name for USG), 20 or 45 minute will allow you to put multiple coats on a patch in a single day. Again there are a number of types of drywall tape. There are only two types that you will probably ever need. There is paper joint tape, usually sold in 250' or 500' rolls. This tape has a ridge down the middle that allows it to be folded and used in corners. 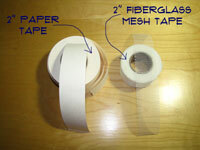 Fiberglass mesh tape is the second option. For repair work this is the king. Both types types of drywall tape come in two inch widths. Wider widths for fiberglass tape are available. Paper Tape has to be installed with drywall compound and allowed to dry before it can be coated. Fiberglass Mesh Tape sticks to the wall by itself and the holes allow the mud to bleed through and stick to the wall. You can put a first coat of mud on immediately. For taping mudding drywall repair projects this tape is the best. For small jobs fiberglass tape is preferred, even though it costs more. It saves one step, thus saving time. The exception to this rule is taping inside corners. Fiberglass tape does a poor job in corners. You want to use paper tape instead. For about ten dollars, you can get a roll of each, should last you for a long time on home repair projects. Mixing drywall compound is always required, even if you have 'ready mixed'. I already mentioned that most compounds come ready mixed. With that said, you usually have to add a small amount of water to get the mud workable. Use the water sparingly, a little bit goes a long way on ready mixed joint compounds. You can mix a pan full right in the pan or you can use a paddle and a battery drill to mix it in the pail. As a rule the mud should start out stiffer and with each coat get a little thinner. Stiff mud right out of the pail is not good to tape with, you will not get enough of it out from under the tape and it will cause your joints to be heavier. Powdered muds should be mixed in a pail with a paddle and drill. Mixing them by hand often leaves lumps that will be quite aggravating during your taping mudding drywall operation. Add water gingerly until you get an even workable consistency. There are no gauges to tell you when it is right. When mixing drywall compound, it should have some body, but be workable. Mud that falls off the knife is too thin. If it feels like you are working with concrete on a hot day, it needs some water. The particular thing you are doing affects how to mix the mud. For taping, you want the mud thinner. When you are 'first coating' or 'bed coating seams and bead, the mud should be stiffer, so that it does not shrink as much. Skim coating as a final pass will require, thinner mud.